Thanks to Fred and Team for the new version! Qt support for Linux is the way to go, I'm very happy about it and can't wait to start testing. Oh, and by the way: Stay cool about the tone of some people here. Don't need to tell you anything about developing and releasing software, just wanted to let you know that I've been through this for decades by myself. Even if you release a program that calculates next week's lottery numbers, some unhappy ones will complain immediately about any crappy detail you never had in mind. That's just how it is! I love PB the way it is and it's developing. When the new LTS is ready it's time for another donation! This signature was removed by [removed] for your own safety. We have introduced this subsystem because there are a number of problems with the Gtk3 subsystem which are rooted in deep differences between the PB and Gtk philosophy and therefore cannot be fixed easily. Qt is much more "PB friendly" as it turns out. Since Qt is also available under the LGPL since some time, there is also no license issue in the way anymore. We are hoping that this new subsystem becomes stable enough to be the new default on Linux at some point in the future. Don't worry if you still want to use Gtk: We do not plan to remove support for it, it just might stop being the default sometime. The license is LGPL and we are not statically linking (the binaries provided with the Linux distribution are used). So the license situation is the same as with Gtk. Commercial use should be no problem. The minimum Qt version is 5.5. Just set "qt" as the used subsystem and all related libraries will switch to Qt (there should be no Gtk dependency anymore then). Of course this also means you cannot use any Gtk functions anymore to manipulate the GUI. PB object access. Returns the JS object representing the given PB object id. More functions may be added later. Even though Qt is cross-platform, there are still a number of OS-specifics that are visible, especially in the details. So we would have to support and bugfix a "different" Qt subsystem for each OS. This is more work than you probably think, even if most of the code is shared. On the other OS we already have a quite good integration with the native API, so we want to focus on that and not spend work on an "alternative" GUI subsystem that most people will not have any use for. As I said above, we developed this subsystem to solve a specific problem on Linux. The benefit of having it available on all OS simply do not justify the cost in my opinion. Thank you very much Fred and Team for the brand new version. I love the DPI aware feature! Great Job! I love the DPI aware feature! I have no idea how it works. Can someone explain? Thanks for the DPI Aware feature. Any thoughts about PerMonitor Awareness? It can be set in the manifest, too. Thank you for the detailed information freak. Keep up the great work Team PB. Things just keep on improving with every release. No, thanks. One of the main advantages of PureBasic is that it creates standalone exes without the need for DLLs and/or runtime files on Windows. Freak, what Linux distribution are you using for debugging at this stage? p.s. I already wrote about this. to gradually look at the possible regress in other distributions. 1. What kind of level of DPI Awareness this new PB version is aiming for on Windows ? System, Per-Monitor V1, V2, something else ? working even if the DPI Aware check in the compiler's options is disabled ? 3. Do those commands reflect dynamic changes in the DPI settings after the process has been started and if queried report the new values ? 4. Do those commands report updated values if the process window is moved to another screen or are tied to the main screen only ? 3. No (in my test) but when changing scale Windows ask to rebbot to complete (sometime), so can't test running program. But maybe I'm misusing the new features? It's a nice one ! Thanks for the tests, I can't do them myself at the moment so I had to ask. So it seems it's a System DPI awareness kind of thing, done once at startup. Last edited by DontTalkToMe on Thu Jun 07, 2018 10:40 am, edited 1 time in total. Everything seems correctly setup for PureBasic ! I only get an error message. Last edited by Trond on Sun Jun 03, 2018 6:13 pm, edited 1 time in total. Simply activate "create DPI aware executable" in the compiler settings and your GUI will be automatically scaled on machines with different monitor DPI settings. 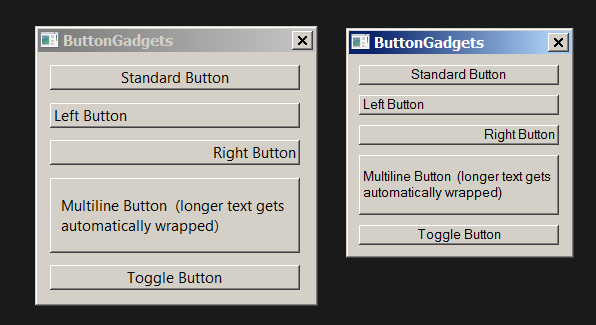 Take the ButtonGadget() example from the help file and compile it with and without the DPI aware checkbox. If you have changed your desktop scaling to 125%, it should then look like this. I use a high DPI monitor on my system, so I set the Windows desktop scaling to 125%. Otherwise the font on the desktop would be too small for me. Non-DPI-aware programs look very small on my screen (like the example on the right). But DPI-aware programs scale their GUI to 125% (in my case) and the ratio "GUI size" to "monitor size" is the same, even if the program runs on a high DPI monitor or on an old 1024-pixel monitor (only if the user has set the desktop scaling to his liking).